The story goes like this. 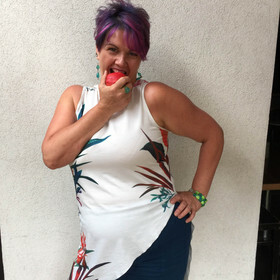 At 46 I was fat, unhealthy and unhappy. I met someone who helped me. I lost 60 pounds in a year, got my health and fitness levels back to where I was when I was in my 20’s. I was so inspired and I knew I needed to help others do the same. I went to nutrition school and become a Holistic Nutritionist. I realized at one point that while in school I was starting to look like all the other nutritionists. Slim, long straight hair, makeup-free face. But I didn’t feel like “me.” I felt like I was playing a role. That didn’t sit right with me so I made some changes. During the second year at school my weight slowly started to climb. Shortly after I was finished, my stress levels (which were already very high from juggling a full time job, intense schooling and the rest of my life) went completely off the charts. Health issues, family issues, work stress and weight gain, all contributed to me being out of control again. This picture is what I looked like for about 6 weeks and this isn’t even the worst of it. 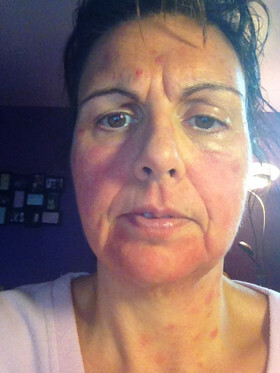 It was a result of an allergic reaction in a body that was already stressed to its max and went completely out of control. That’s when it happened. I started to beat myself up. I started to feel like a fraud. I felt like “how can I possibly help others, and what kind of credibility do I have, when I can’t even keep my own weight and health under control?” I spiralled so far down I started to get worried. Then I got the help I needed, got my health back on track and my mind was more settled. I still had this problem though. It’s called comparison. 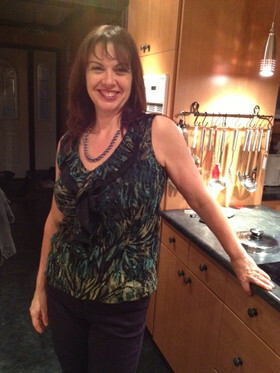 First I was comparing myself to other women, especially other nutritionists. I didn’t look like your typical nutritionist, so I decided to embrace it. I totally changed my look. I cut my hair into a short, funky style and now have 4 different colours in it. And I’ve embraced this look because this is “me”. Once I got my head out of the comparing-myself-to-others phase, I started comparing myself to where I was after I lost that weight 4 years ago. I did it before … why can’t I get it under control? I used to look like I had credibility. What happened and why isn’t my weight coming off like before? That’s when I looked into my hormones again. I’m at that wonderful age of menopause, which is not an excuse, simply an explanation. Being menopausal, however, does not mean I have to resign myself to being overweight. I did a 10-day body reset detox (which will be available for purchase on July 22nd) and it’s made a huge difference. It got me back into healthier habits (I was slipping) and I’ve been exercising more consistently the past couple of months. I’m feeling lighter, healthier, better than I’ve felt in quite some time. It hit me the other day that I don’t compare myself to anyone (including myself) anymore and as long as I’m doing what I need to do to keep my health on track, I know that the fat will come off and my fitness level will go up. The moral of this rather lengthy story is to encourage you not to beat yourself up if you have gained weight or if your health has declined. Don’t ever compare yourself to someone else. You don’t live their life. You don’t know what struggles they are going through. One of the best things I can encourage you to do is to relax. Don’t obsess about weight or health. Seek out help with your health, whether it’s from a nutritionist, a naturopath or a health coach. I encourage you to drink plenty of water (preferably with lemon), get sufficient sleep (7 hours is a good compromise for those of us who are living jam-packed lives), move your body (even if it’s just a half hour walk every day), eat whole, nutritious foods (like fruits, veggies and some lean meat) in appropriate portions and meditate and/or journal every day (even if it’s only for 5 or 10 minutes). As always, I am here to help, provide guidance and cheer you along on your journey. 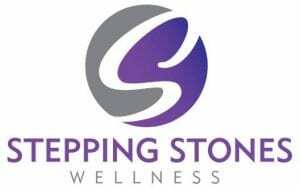 You can always email me at sandy@steppingstoneswellnessinc.com. If you’d like to receive a weekly dose of information, you can sign up for my newsletter here. NextWhy Detox? What’s in it for me?